MESA, Arizona (seminoles.com) – As the No. 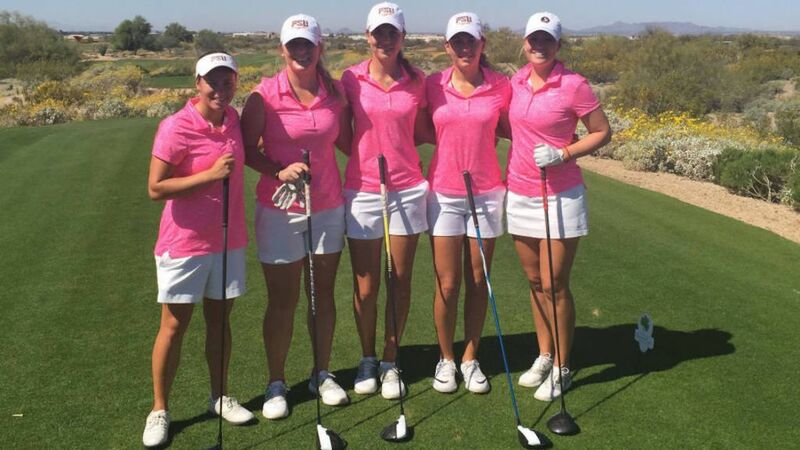 3 ranked Florida State women’s golf team begins play in the Clover Cup at the Longbow Golf Club in Mesa, Az., it tees off looking to rewrite the Seminole record book. The Seminoles will play for their school record sixth team championship of the year including their third consecutive after winning the championships of the Florida State Match-Up and The Dickson Invitational to begin the spring season. But seventh-year head coach Amy Bond isn’t chasing records and a new page in the record book isn’t what she is hoping for this weekend. Certainly, she’d be thrilled should her team win the championship and add another trophy to their team room at the Don Veller Seminole Golf Course. Florida State’s first appearance at the Clover Cup is about learning to play on a different golf course under different playing conditions against a number of teams the Seminoles haven’t faced this season. With only two tournaments remaining in the regular season, the tournament is continuing to prepare for success in the postseason. Ranked No. 3 nationally, the Seminoles are one of four top 30 teams in the 15-team field. The Seminoles will be challenged by No. 4 Arizona State, No. 24 Oklahoma, No. 26 TCU as well as Vanderbilt and Kentucky of the SEC and Indiana, Minnesota and Nebraska of the Big Ten. Junior Morgane Metraux, who has won the individual titles in the last two events and who is ranked sixth nationally in the GolfWeek rankings, agrees with her head coach. Metraux enters the Clover Cup averaging a career-low 69.90 strokes in 20 rounds during seven events this year. In earning medalist honors in the last two events, she is a total of 25 strokes under par and set the school record for most strokes under par (-14) in winning the individual championship of The Dickson Invitational. With five wins in their first seven events of the year, Florida State has played sensational golf since opening the year with the team championship at the Schooner Fall Invitational. The Seminoles have finished under par in four of their five championships and won their five titles by an average of 17 strokes. Senior All-American Matilda Castren, won the individual championship at the Jim West Challenge during the fall season, is ranked 14th nationally among all collegiate players. She enters the Clover Cup averaging a career-low 70.90 strokes – an average that has lowered her school record average to 72.37. With it being spring break on the Florida State campus this week, Bond took the team to Arizona early to see a part of the country they had never seen before including a trip to the Grand Canyon. For the Florida State women’s golf team, it would be as beautiful as adding a new page to the record book and a new trophy to their team room.